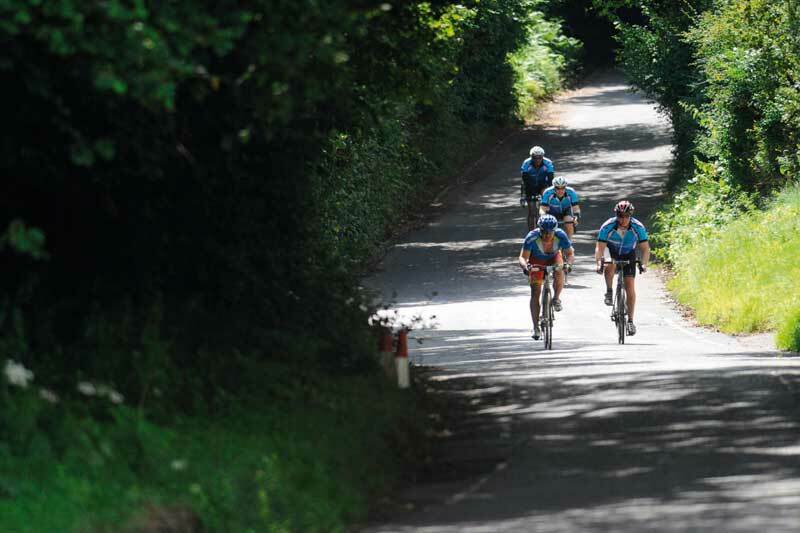 Billed as ‘undulating terrain’ the Action Medical Research Surrey 100 proved to be a lot tougher than many riders expected and showed that there are many more climbs in Surrey than Leith and Box Hill. For a first time event we are delighted with the turnout, the feedback has been excellent. 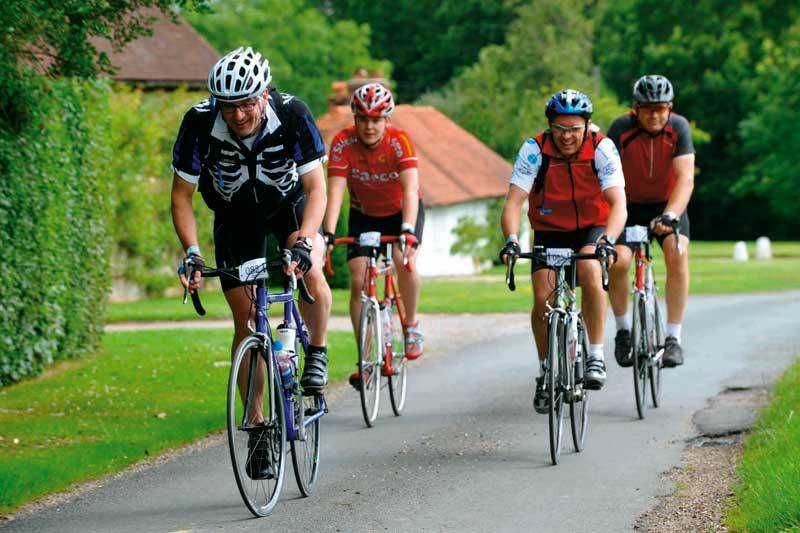 Cyclists come along to our events knowing what to expect and we don’t disappoint. The route was testing at times and took in some fantastic countryside along the way. We captured the key features and gave the cyclists a challenge to remember. The Surrey 100 is one of five new rides that Action Medical Research has added to its calendar this year. 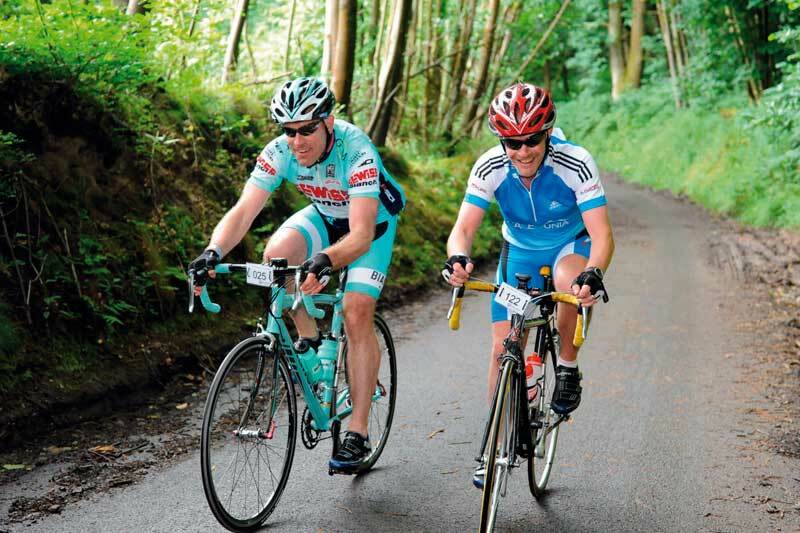 This 100-mile challenge takes in some of the region’s cycling hotspots and that included hills! A field of 182 riders took to the roads from Artington in small groups from 7.30am. A good mix of cycling enthusiasts turned out including a couple riding a bright yellow tandem. The good news for some was that Box Hill wasn’t early but came at a much later stage of the ride. Firstly there were the Sussex hills to contend with and just before the 20-mile stage the first testing climbs appeared; Beacon Hill and Ferndon Lane, where the damp road added to the difficulty. A welcome feed station in the picturesque village of Midhurst awaited the riders after the long descent. The next 20 miles consisted of rolling hills along quiet lanes where a crosswind made its presence felt. The lunch stop at Thakenham was well worth pausing for and a few would like to have stayed rather than face what was ahead – Leith Hill and Box Hill, the giants of the Surrey Hills. The selection of food available would have been welcome at any wedding buffet but this was a charity cycling event; tuck in and enjoy! The weather was also turning and there was the occasional shower which for some was welcome, as it was humid at times. Leith Hill at 826 feet was the highest point of the ride and provided the biggest challenge of the day for some and then to face Box Hill within the next 10 miles, it was certainly going to test them. A welcome feed station in Dorking prepared them for the assault on Box Hill where it was approached from the east so that the hairpins were encountered on the descent. The run-in to the finish at Artington was fairly flat and a warm welcome was waiting for the riders. Each was welcomed back and presented with a medal, t-shirt and goody bag. A free massage was also available and many took advantage to pamper those legs. It was a fantastic experience and something I’d like to do more often. Actually, I had done a couple of other charity rides this Summer but the Surrey 100 was definitely a lot more challenging and so, bizarrely, more enjoyable. We all knew the weather wasn’t going to be great but I guess it’s all part of the experience come wind or rain… we got both! The Surrey 100 is the first cycle event that I have entered so I really didn’t know what to expect but I needn’t have worried; it was such a well-organised event both pre race and on the day that I could just get out there and enjoy it. I met some great people and can’t wait until the next event! The Surrey 100 was my third and longest sponsored ride, so entering it was both exciting and daunting. This ride was the most physically enduring thing I have done in many years. The course took me and my fellow riders by surprise, particularly the climbs near the end after Box Hill. It has however inspired me to achieve a challenge of my own to ride a further nine of the 100-mile rides before I am 50. If there is one thing I learnt from this event, it is to study the route profile better beforehand! Knowing some of the course I thought it would be a rolling ride with nothing too serious until the 70-mile mark and then the big climbs of Leith Hill and Box Hill and a flat ride to the finish. The realisation that it wasn’t quickly set in when after the usual quick first hour Beacon Hill was a bit longer than expected – this would set the tone for the day. The first real shock of the day though was Ferndon Lane. This 16 per cent climb was really vicious as the road was not only steep but damp and slippery making the back wheel spin if you got out of the saddle. Once over the top it was downhill all the way to the second feed stop where a welcome selection of food and drinks awaited. The next twenty miles flew by in beautiful countryside until the lunch stop at the halfway point. This really was a lunch stop and has got to be the best I have had on a UK sportive. A full buffet was available with plenty of homemade food and, even better, cakes. Back on the road again, the next section was mostly flat before reaching the first of the two real climbs of the day at Leith Hill. This wasn’t as bad as expected as the course really had thrown up a lot of surprises by this point and Leith was no different. Descending to the feed stop at Dorking meant three quarters of the course was covered with just Box Hill to go. Climbing it from the Leigh side was something I wasn’t looking forward to and it was every bit as bad as I thought. After descending via the zigzags we went up again towards Ranmore Common which meant there was still plenty of climbing to be done. This was definitely the worst part of the day as the distance was taking its toll on the undulating roads. Dropping back down towards Godalming, I knew the road would flatten out and I was rewarded with a flat, fast route back to the finish. Although the event was far hillier than I expected, I still really enjoyed it and found out the hard way that Surrey has more than two hills!